The lovely and I spent much of today walking around the city and enjoying the sights. A fantastic lunch, and after unsuccessfully trying to dodge a rainstorm, we made it back to the hotel. And, given that I am giving a couple of presentations in Greece, I hopped online to check my email for some important updates. I went on just to see. And what should appear but a Syroco Tramp with a smokin’ price. Knowing that I have someone that is looking for one, I didn’t hesitate. 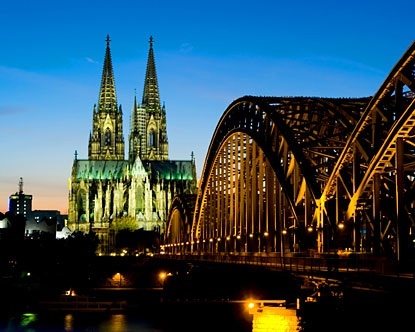 The lovely certified personal trainer and I hop on the boat tomorrow morning to head to Cologne for the CCCC meeting. Not that we are taking a boat to Cologne, we are merely taking that to the mainland. We will be flying to Germany. And, the bags are all packed up and ready to go. A small box of corkscrews including a few rare D.R.G.M pieces and the recent Fishbones & Cat find will be traveling along as well. Hopefully at the meeting someone will be able to tell me more about the Fishbones. 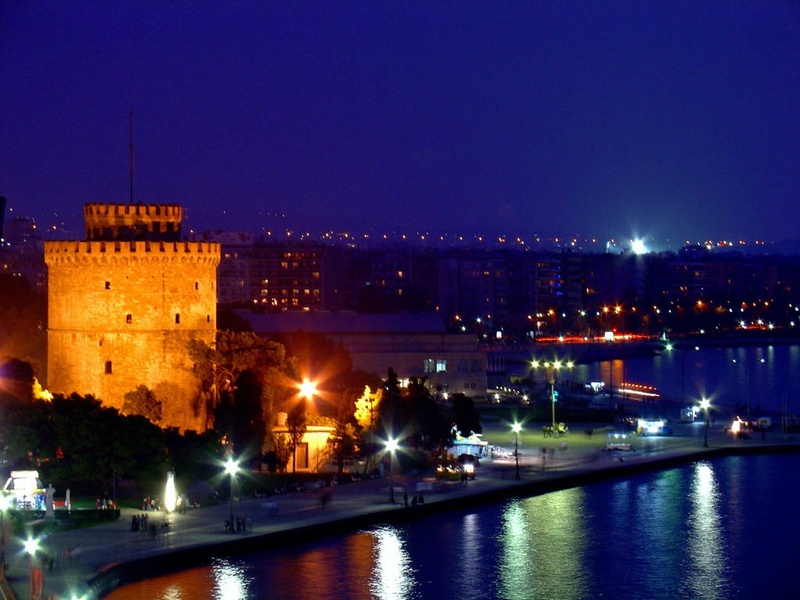 After a few days in Cologne, we head to Thessalonikki, Greece for the ICCA Annual General Meeting. And, we are quite excited as neither of us have ever been to Greece before–we aren’t sure if the Fishbones & Cat corkscrew has previously visited, as he has remained rather silent since his arrival. That said, I will have my camera and laptop with me, so I plan on updating the blogs as corkscrew deals are made and corkscrew finds are found! A neat looking mechanical corkscrew turned up on eBay today and as is oft the case, shortly thereafter, it was revised with a Buy it Now. I hesitated or a moment, as I had never seen this particular corkscrew before. 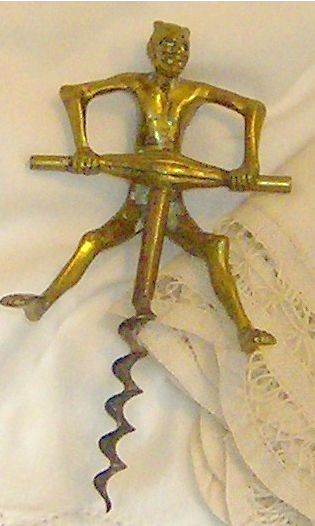 Listed as “Cat & Fishbones Brass Art Deco Figural Corkscrew,” I threw caution to the wind, and promptly clicked the appropriate BUY IT NOW button. Of course, after winning the listing, the phone rang. It was the person who had requested the Buy it Now, explaining that they asked for it, but had to step into the shower, as they were heading to Phoenix to drink some Burgundies. Does anyone know where it comes from? Age? Origin? Maker? In 2009, Fred O’Leary published an update to his fantastic book on American Patented Corkscrews. 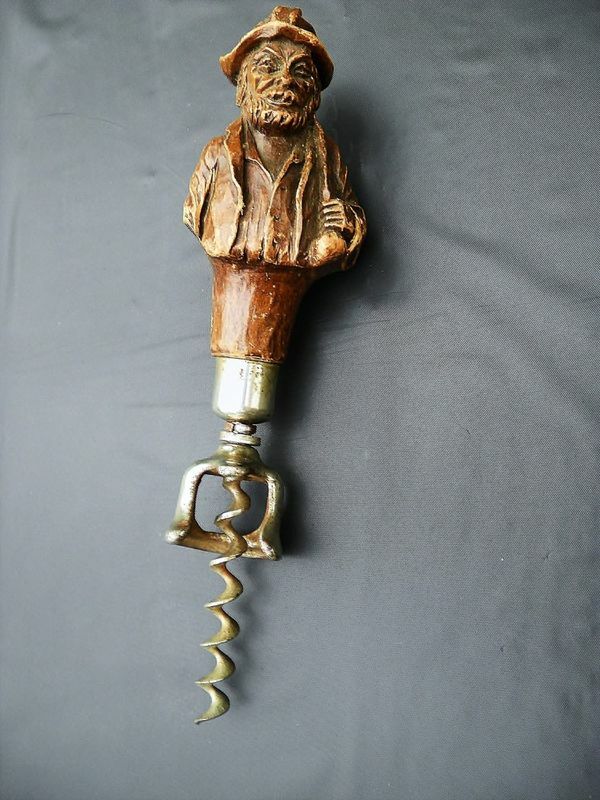 The update included an array of patented and patent pending corkscrews that had been discovered after the publication of his book. 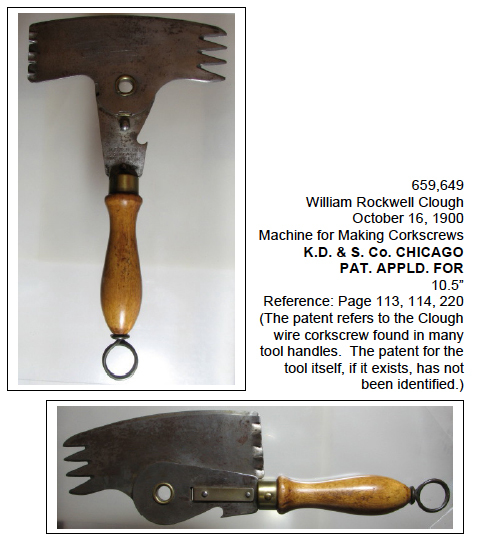 And, while we are all aware that there are many many other patented pieces that are out there that we have yet to hunt down–as to this point they have never been photographed in captivity–the update does provides a few more corkscrews to search for, as we know that they actually exist. One of the corkscrews pictured is an unusual meat cleaver–although the patent itself is thought to be for the Clough Corkscrew that is inserted into the handle. 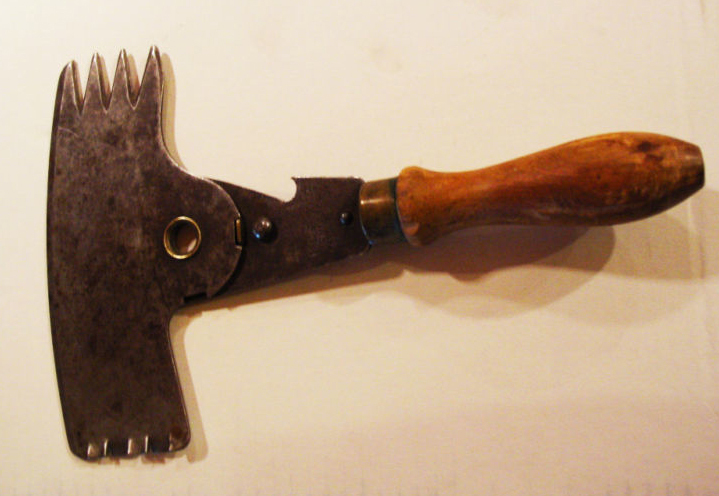 Yesterday, a very similar unusual meat cleaver was ending on eBay. It had one bid, and was languishing at a whopping $ 4.95. I looked closely at the handle of the piece. No corkscrew… I went back to Fred’s update, and studied the picture. And, then I went back to the cleaver online. Could it be that the Clough corkscrew has simply gone missing? So, I decided to take a chance on the cleaver. If when it arrives, it does have the opening in the handle where a Clough wire corkscrew should be inserted, I will report the news here. If it doesn’t…well, I will report the news here. It is that time of year again, and on Saturday I will take the boat from the island, hop in the mini, and head to the Union Antique Show. Every time I have been to the show, I have picked up at least a couple of corkscrews; last year was a signed Chinnock patent with Frame for 20 bucks. If anything turns up on Saturday, I will post news of any finds on Sunday. Until then, here is the latest addition. Not a corkscrew, but a nicely carved boat sign, which seemed an appropriate name for our house on Vinalhaven, especially given the amount of wine that is consumed on the deck overlooking the harbor. I have to admit, I have been remiss in my blogging duties. I do apologize. However, August on the island is a very busy time. And, while you all might find it hard to believe, eBay and online corkscrew hunting has taken a back seat to friends, family, music performances, kayaking in the basin, swimming at the quarry, boat trips to North Haven, gallery openings, training for the Portland Marathon, pouring wine, and (yum) smoked scallops–speaking of yummy goodness, I am still on the hunt for some chanterelle mushrooms, if anyone can spare some. So… if you find that your emails are not getting responded to with the same rapidity that you are used to, or if there are indeed fabulous corkscrews on eBay that I am not going after, don’t worry…I will be back at it soon enough. Speaking of fabulous… the devil corkscrew arrived yesterday, and it is indeed awesome. Peter’s BIN contest has officially started, and how could I resist when this appeared today!!!! !